Do you really need to spend more than £2 on an HDMI cable? When you've ever been persuaded to buy a new HDMI cable using the "3D upgrade" or future-proofing arguments, the chances are that you were ripped-off, though by who, exactly, is a grey area. Riddled with complex, largely meaningless technical specifications, expensive licensing arrangements and at its core a cable that's not versatile enough for a lot of mainstream situations, the world of HDMI is a confusing one indeed. Does the price of a HDMI cable affect the picture quality? "Will using a £5,000 USB cable make your printer better?" asks Chris Pinder, Managing Director at HDcable.co.uk, rhetorically. "I've been selling HDMI cables for years and I can say 100% that the technology, and specifically the price of an HDMI cable will not affect the picture quality by one pixel." The innovations and price differences, says Chris, is to do with things like different sized connectors – slim designs for fitting better into wall-hung super-slim LED TVs, for instance – rather than materials used in the actual cables. "Under five metre an HDMI cable made correctly cannot introduce any degradation to picture and sound quality," says Chris. "There are no subtle variants. If you have a digital photo that you email to 5,000 people, the quality will be the same on. It's the same principle with HDMI." "There's a greater variation in how TVs are set-up in homes than differences in cable quality," says Tim O'Malley at Wavelength Distribution, which sells Supra HDMI cables. "You might find three people, each with different HDMI cables, but the quality of the picture will differ because one TV was simply unboxed and switched-on, another was adjusted by the user, and another was fully installed and calibrated by the person that sold the TV." One that works – there is no upgrade argument to be had. Conducting material used in the HDMI cable is all-important, though relatively standard. All official HDMI cables use the best insulation possible, the same quality plugs, and usually solder-free cold-welding that prevents copper strands from being joined. HDMI cables carry gigahertz of very high frequency signals that travel on the surface of conductor material – usually copper, sometimes silver. Many HDMI cables are actually hollow since the signal travels around the outside of the cable, which is why upgraded versions for long runs tend to be silver plated, rather than solid silver. More important is that a HDMI cable is lain flat – something that's actually tricky to do even in a basic set-up – because every bend or kink reduces the bandwidth (speed) of the cable. On that note, steer clear of 'flat' HDMI cables; there's simply not enough room for a twisted pair of copper wires to conduct without interference. There's another problem here that actually increases with price; the heavier the cable, the better quality is probably is … and the greater likelihood that it will fall out of, say, a TV's HDMI input. It's more evidence for those that think that the HDMI standard is poorly thought-out, riddled with basic problems and just isn't up to the job. Can you measure any difference in video quality between expensive and cheap HDMI cables? "If people can see the difference between HDMI cables, good for them," says James Luce, Brand Manager at Acoustic Energy and responsible for calibrating screens for trade shows and demonstrations. "On the measuring equipment I use I can't tell the difference between a top-of-the-range HDMI cable and a £5 one from ASDA." James explains that both cables measured exactly the same colour levels, and told TechRadar that the set-up he was showing the public – a Panasonic plasma connected to an Acoustic Energy sound system – employed two HDMI cables from … Tesco. James' advice is to forget about HDMI cables and, if you want to get the picture on your TV to be as good as possible, to spend £100 on an i1LT meter (it's more sensitive than the human eye in measuring light and colour), download the free Colour HFCR calibration software from the web, and bone-up on how to professionally calibrate a TV. Do I need to upgrade to a 'high-speed' version 1.4 HDMI cable for 3D? No, these standards are virtually meaningless for consumers – they simply refer to electronics and not to the cables themselves. Think about it: when did you last experience an 'HDMI failure'? 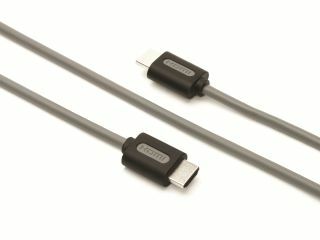 A well-made HDMI 1.1 cable purchased five years ago is already 'high speed', will almost certainly carry 3D and almost everything that an HDMI 1.4 cable can. For short HDMI cables under five metres, 'high speed' is meaningless marketing jargon for 'over-specified for the task'. You couldn't even argue a future-proofing standpoint for 4K resolutions; any HDMI cable with a decent amount of copper, good geometry and good shielding should be able to do 4k, though that can only be said for sure for five metres-or-under HDMI cables. Above that you really do need a very well put together cable for 4k transmission. What about new HDMI cables with Ethernet Channel? Surely the chance to use fewer cables is worth paying for? You would think so – and in the era of 'smart' TV this two-in-one HDMI cable appears awesome in theory – but since not a single manufacturer has made a product compatible with this brand new HDMI standard, it's (so far) completely meaningless. Why are big-brand cables so expensive? Although build quality does matter for HDMI cables over five metres, the reason why even cheap cables can cost £10+ is down to licensing fees. Sources in the industry tell us that an HDMI cable manufacturer has to pay a fee of over £3,000 to the HDMI Organisation to have a new, or even a subtly re-designed or re-packaged incarnation of, an HDMI cable officially tested and sanctioned. It's only then that the HDMI logo can be used. Meanwhile, logo-less versions of HDMI cables are coming out of the same Chinese factories and appearing on eBay for a few quid. Should I buy cheap HDMI cables on eBay? We found HDMI cables selling on eBay for as little as £1.29, but they can't be as good as bone fide big brand cables, can they? Well, actually … for short-runs – i.e. taking video from a Sky box to a TV nearby – the chances are that these kind of cables are absolutely fine. They come from exactly the same no-name factories as the expensive cables, but haven't been through pricey testing procedures, so they could be duds – and they're low price suggests they've probably without decent shielding – but these logo-less HDMI cables are from the same production line as cables that have passed the test. Buying from eBay is in some ways risky, but at this kind of money, who cares? If it doesn't work, throw it away! We would, however, give cheap, long HDMI cables the swerve. Could the quality of a HDMI cable affect sound quality? For the answer we asked Alasdair Patrick, The Answer Man (nice job title!) at Audioquest, to put the case for carefully choosing an HDMI cable to maximise audio. "Though the improvements to video are only slight, the quality of an HDMI cable makes a difference to audio by reducing distortion and interference," says Alasdair, who underlines that HDMI is now a de facto audio cable. "Most people with Blu-ray players and bigscreen TVs will have an AV receiver capable of 7.1-channels of uncompressed, lossless audio in the Dolby TrueHD or DTS Master Audio formats, and they have no choice but to use HDMI," he says. "That's a lot of surround sound data as well as video, and though no HDMI cable can improve the signal, the best ones don't introduce distortion or degrade the original signal." Is it ever worth splashing-out on good quality, expensive HDMI cables? Yes. While a one metre HDMI cable is really not worth paying through the nose for, those needing long lengths should be a lot more careful. For home cinemas this is particularly important; installations where a projector is mounted on a ceiling some way from the AV sources will have to use a fairly pricey 10-15m HDMI cable, but they're pricey because they're up to standard – there's not much choice in the market here anyway (read: buy the cheapest – don't be fooled into thinking that there's much difference between two 15m HDMI cables). "It all boils down to the distance the signal needs to pass over," says Tim. "If the internal resistance is too high, the receiving equipment won't have anything to lock onto the it simply won't work – you won't see a picture." That's a key point to remember; if a HDMI cable doesn't work, then it's probably a cheap one. If it does work, it's fine for what you're using it for. The only other situation where you'll see a blank screen is if your AV equipment isn't set to automatic mode, preventing it from auto-configuring. The 'dark art' of HDMI cables is really just a misunderstanding – and a lot of misrepresentation – of how and when quality is important. If you want to attach a Blu-ray player, set-top box or games console to a TV from directly underneath it, a cheap, perhaps even in-the-box HDMI cable will do just fine. There's no need to pay more than £10 – and don't be misled by information on different versions, speeds or features. Ebay's cheapies can't be ruled-out; it's not a compromise you're making, it's risk – a really badly made HDMI cable might not work at all – but it's a smaller risk than you might think. Much more important for those after best quality pictures is a proper calibration of a TV, though if you need a HDMI cable over five metres, you will have to spend considerable cash; well-made cables capable of delivering signals over long runs are expensive to make and sell for proportionally more than short HDMI cables, which can be manufactured simply and with less expensive materials.